When faced with adversity, you respond with authority. You don't let problems faze you. You are naturally powerful and commanding. People look to you to take charge. You are elegant and classy. You know how to always say and do the right thing. While you stand out, you also fit it. You thrive in a variety of situations. On a rainy day: you carry on as normal - a little bad weather isn't going to get in your way ! Well, far be it from me to contradict any quiz that says I'm elegant and classy but there was no leopard print umbrella to check, which is what I own. I'm far more likely to slap on my safari rain hat anyway. I like to have both hands free. There's more progress on the sleeve of Mary Tudor than this picture shows but moving (the office) has kind of sapped me. 60 boxes. And the stupid elves haven't shown up to finish the job yet either. Gah. Having an opposable thumb is not all that it's cracked up to be either. It's either arthritis or I've strained it? Who knows. I can knit, but I can't really play on the computer for long - and not having a computer at work hasn't helped much either. That's where all the lifting stuff happens. Hezekiah officially hates the rain. She insisted on going outside on Saturday even though I told her we were moving the office and I wouldn't be home all day and it was POURING. She was drenched and mad as a wet hen by the time I got home. So today I insisted she stay inside. 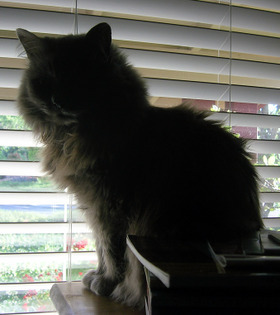 When I got home she wanted outside via the garage door, the sliding glass door to the backyard and the front porch. Can you believe it? IT WAS RAINING OUTSIDE OF ALL THREE DOORS. The horror. This is Nerissa, my new niece. Isn't she darling? Last week, a box came in the mail from KnitThink. Inside the box - many many apples (and popcorn, although not nearly as edible). I can see why people love apples now! They were crunchy! There was this wet stuff - my mother - who is from Michigan and wise and knows these things - said that it was called "juice". It was a revelation. I still have to think of something wonderful in return. No wonder people eat an apple a day to keep the doctor away. I wonder what four a day will do? I've been working on the beaded scarf that The Fairy Godknitter sent me and swatching for the Veronica yarn from Dizzy Blonde Studios. While sorting my UFO's I found my half done sock from Bellamoden's The Moon is a Harsh Mistress - I think I've figured out how to fix the heel turn in pattern. And now I'm wondering how she's doing - I've been so wrapped up in moving and knew that she'd come through her surgery, I haven't gotten any more updates. I'd list my October reading list but it's on my computer at work, which is currently dead on my desk. Furthermore, if you don't vote, you are barred from either crowing or complaining about the outcome now and for the next four years. This will be ruthlessly enforced. Hez sez "It's what time? What? I'm not getting up now. Go ahead. Get breakfast ready, willya?" Notice how Hez can play with her mouse and keep an eye on me. Just in case I decide to take another vacation. I think any requests are going to be denied. And then she's taking her turn in The Chair. She's been sleeping in it at night. In fact, she's been hopping into it the second I get out of it, whether I'm done with it or not. Then gives me The Look. I have done nothing at all on Mary Tudor, she stays unsteeked. I did get the cable cardigan seamed - all but the collar and the crochet edging. I'm convinced I've seen a collar sewn on with i-cord - wouldn't that look so much nicer? It's possible all my knitting mojo has been sapped by The Fairy Godknitter who sent me this and that is all I've been doing. The winding of the skein (I really, really need to pick up a ball winder one of these days - the yarn is Heather by Schaefer and the colorway is called Georgia O'Keefe. It was the most weirdly tangled yarn I've ever wound. It would be fine and then all sorts of fishnetting. So after an evening of ball winding I spent an evening of bead stringing. It's possible that the reason that you're not supposed to string eleventy million beads on all at once is that you'll be shifting eleventy million beads for virtually an entire skein. Cookie also pointed out that it could be hard on the yarn. I didn't mean to string them all on, I was watching MI-5 and didn't actually notice. And now I'm attempting to master the art of bead knitting. It's fun, but I'll tell you, NOTHING comes easily to me. Stupid learning curve. At least I'm hoping it's a learning curve. TV is picking up. Mad Men on AMC Sundays, The Sarah Conner Chronicles, Heroes and My Own Worst Enemy on Monday (am I the only one who thought that "driving your car and driving a wife are two entirely different things" was funny? It keeps getting dissed but it cracked me up. Besides, I like Christian Slater. The show was a little uneven but it was only the first episode, unlike Heroes whose sole purpose lately is to be confusing as all get out. The bad guys are good! The good guys are flies! Oh, Mohinder. Cocooning your neighbor is just such a bad idea. Unless he's Wilford Brimley). Tuesday nights, watch The Mentalist with Simon Baker (of The Guardian, Smith). And NCIS and House, which is a little harder since they're on at the same time. CUT THAT OUT. What else was good? Hmm. Life on Mars wasn't bad. Odd, but not bad. I've got to see the original BBC version now. And Life wasn't bad either. What's this, it's second season? I thought it sounded ridiculous, a former cop going to prison and then being freed and reinstalled in his job but.....it's pretty good. Friday nights at 10pm on NBC. I think NBC does not have a lot of faith in it. Look what mrspao sent me! All I did was admire her stitchmarkers.......and she sent me stitchmarkers (that she made) not to mention a necklace (that she made), matching earrings (!) (that she made) - wowza! I was complimented on the necklace and earring set so many times yesterday, it was lovely. It was also a bit unnerving. Do I never dress up at all? Check out the cute duck! 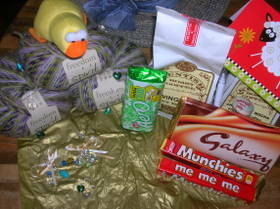 and the coffee and the chocolate (which mysteriously has vanished), the lollypop, the pen and the lovely wool yarn. Isn't the name on the chocolate perfect? me me me. The Quest was: Quest Three: Read at least one book from each of the four genres of story (Mythology, Folklore, Fairytale, and Fantasy) and finish up the challenge with a June reading of Shakespeare’s A Midsummer Night’s Dream. I managed to read two books that covered all four of the categories, Emerald Isle edited by Andrew S Greeley that was short stories and Pride of Kings by Judith Tarr. Pride of Kings was about Richard I and John Lackland, sons of Eleanor of Aquitaine (not coincidentally one of my favorite historical women) and their struggle for the throne. As it turns out, they're both crowned, at the same time. One is King of Britain, one King of England. And yes, both quite different countries or should I say realms? I could have gone without the romantic entanglements of Arslan, the Turkish boy that's the protagonist of the story. For one thing, they kept calling him a child and yet married him off. For another, his wife had the stupidest fight with him - well no. She had it all by herself. It ruined the book a bit, wanting to slap her upside the head. So I didn't manage to read four books and the play. I managed two books and the play. And I barely squeezed in A Midsummer's Night's Dream - I listened to it on audiotape yesterday. Shakespeare sounds so incredibly lilting when spoken. For once, an audiobook truly enhanced the experience. Also? fairies are mean and people are fools. But entertaining. What was the best book you read this spring challenge ? Of the three? Clearly none. I enjoyed both books, if not all the characters and the short stories. I do have Orson Scott Card's Magic Street waiting for me. Unbelievably, I've never read a book of his. There were authors in Emerald Isle I hadn't read before, but for the most part, I was familiar with all of them. Judith Tarr wrote a time travel historical novel with Harry Turtledove called Household Gods that I particularly liked when I read it a few years back. If there were books you didn't finish, tell us why. Did you run out of time? Realize those books weren't worth it? Did you come across a book or two on other participants' lists that you're planning to add to your own to-be-read pile? Which ones? I ran out of time, but other than Madwoman in the Attic (references fairy tales and myths), I hadn't started any other book for the Once Upon A Time Challenge. And I always come across books on the other participants lists! What did you learn -- about anything -- through this challenge? What was the best part of the Spring Reading Thing challenge? Would you be interested in participating in another reading challenge this fall? I learned that I always bite off more than I can chew! But it's worth it to try. I think the best part of this challenge - and all the others, is reading everyone else's reviews and insights and stretching my reading habits a bit. What're you looking at? I'm not the one who brought knitting, books, and lunch in a Powell's bookbag and managed to leave my purse at home.....also a helmet? Basically a giant heel turn? Is it taking me a week to finish? It is not.